Honor. Courage. Commitment. Those are the values of the United States Marine Corps. They’re also the values Mark Richmond brings to the jobsite everyday as a union electrician apprentice. Mark spent six years in the Marine Corps Reserves 3/25 out of Akron, OH. He was on active duty for a little more than a year-and-a-half, spending eight months in Afghanistan, and he feels his military experience translates naturally to the electrical industry. Second-year residential apprentice Mark Richmond shares his experience while on a new home construction project in Boardman. VIDEO: Mark Richmond discusses his military background and apprentice experience to-date. 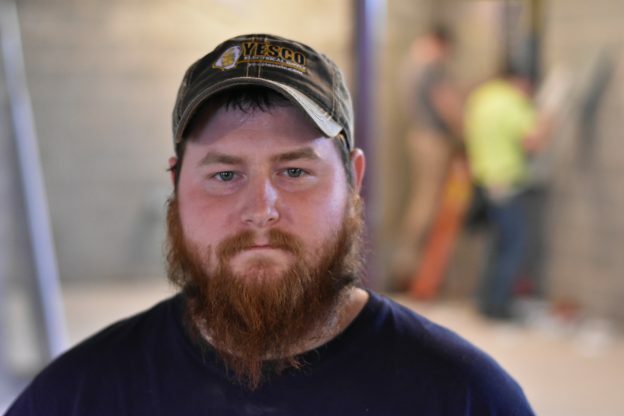 For Richmond, it’s all about the opportunity he has received as he continues to grow and use his skills during his second year in the residential electrician program at the Youngstown Area Electrical JATC. Before the apprenticeship, Mark was working in a service department and looking for a job with good benefits and steady pay to take care of his growing family at home. Thanks to a program called Helmets to Hardhats that connects servicemen and women to careers in the building trades, Mark’s path led him to JATC. With a wife and two young children, Richmond says it takes dedication and a delicate balance when working eight hours a day and going to class two nights a week. But he believes the sacrifice now will be worth it at the end of the program. “It’s a little difficult doing this [program] right now with a family, but it will benefit me in the long run,” he said. During his time in the residential apprentice program, Richmond has already worked on installing and troubleshooting electrical service on several houses around the Mahoning Valley in addition to apartment buildings in downtown Youngstown. He credits this hands-on experience alongside journeymen electricians with helping him quickly learn the trade. “It is a fantastic opportunity that I hope many people will take advantage of,” he said. As he looks toward his future, Richmond aspires to one day upgrade to the commercial side of the trade and just continue to learn and advance in the field.